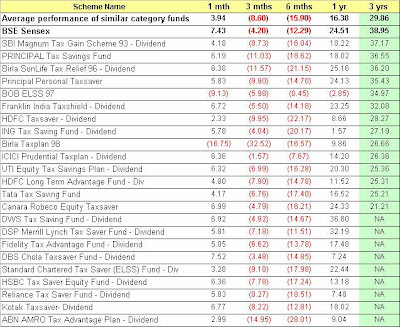 ELSS Schemes Performance Comparision-May 2008. Investments in Equity Linked Savings Schemes, popular mode of investment for tax planning purposes has increased over the period of years. Below is the comparision of some of the schemes. All investments in this category of mutual funds are eligible for tax rebates and have a lock in period of 3 years from the date of investment.